On October 22, 1950, over 500 members of the Screen Directors Guild met late into the night at the Beverly Hills Hotel. It was a special meeting, called to discuss Cecil B. DeMille's rather sneaky attempt to recall Joseph Mankiewicz as the group's president, due to the director's opposition to an anti-communist loyalty oath, while he was vacationing in France. This tension-filled gathering, dominated by the most powerful directors in Hollywood, led to dramatic changes for the Guild, in addition to decades of exaggerations and fabrications about the events of that night. 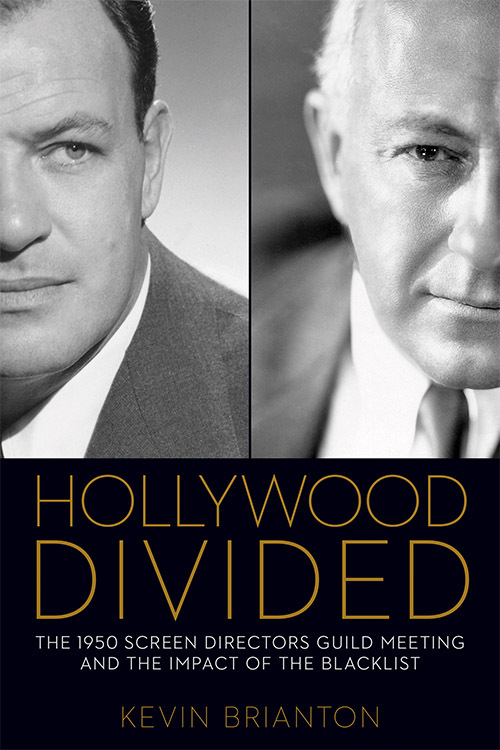 In the short but substantial Hollywood Divided, Brianton describes this HUAC-era conflict in detail, picking apart each rumor to find the truth about an event that would shake up the guild's board, and revealing how it would affect the film industry. He describes the events that lead to the meeting, including a brief background of HUAC and the black and gray lists enforced by the studios that affected many filmmakers. He describes the main players, focusing Mankiewicz and DeMille, digging into their histories and describing their reputations, so that the events of October 22 can be better understood. Hollywood Divided is a window into the intellects of the men whose works drove Hollywood (Ida Lupino, the only female director present that evening at least gets a hat tip) and how they related to each other. While directors like George Stevens, John Huston and Rouben Mamoulian showed their disapproval of DeMille with varying degrees of passion, John Ford commanded the room at a key moment to defend C.B., claiming he didn't like him, but that there should in essence be a civil resolution to the conflict. This uneasy brew of anger, fear and adherence to gentlemanly codes of conduct seems to speak to the changes to come in Hollywood and American society at large; the young directors had a different way of approaching the issue than more established filmmakers like Ford. While I have some interest in the politics of the HUAC era, I had my reservations about reading this book. As a person who avoids meetings at all costs, how fascinating could it be to read a book about one? But to be serious, Brianton's account of the night of October 22 is as riveting as a big screen thriller. With several of the best minds of Hollywood all speaking passionately about the matter at hand, it should be no surprise that the whole thing played like a drama, and Brianton captures all the details that made the evening fascinating, frustrating and consistently surprising. The best section of the book describes the event in great detail, capturing the mood of the night and providing insight into the words of each speaker. It's an interesting window into mid-century politics in Hollywood and the inner workings of the boy's club that shaped American cinema during the studio age.